Exclusive psalmody is the practice of singing only the biblical Psalms in congregational singing as worship. Today it is practised by several Protestant, especially Reformed denominations. Hymns besides the Psalms have always been composed by Christians, but psalms were preferred by the early church and used almost exclusively until the end of the fourth century. 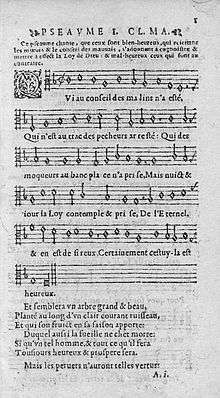 :40 During the Protestant Reformation, Martin Luther and many other reformers, including those associated with the Reformed tradition, used hymns as well as psalms, but John Calvin preferred the Psalms and they were the only music allowed for worship in Geneva. This became the norm for the next 200 years of Reformed worship. Hymnody became acceptable again for the Reformed in the middle of the nineteenth century, though several denominations, notably the Reformed Presbyterians, continue the practice of exclusive psalmody. The practice of exclusive psalmody is sometimes based on a strict (sometimes called 'Puritan') interpretation of the regulative principle of worship, the teaching that only scriptural elements may be included in worship. However, John Calvin did not invoke such a principle in his justification for the practice. Later exclusive psalmodists contended that since God has given Christians a collection of 150 worship songs and provides scriptural examples of them being sung, God requires these songs to be used in public worship and forbids others to be sung (2 Chronicles 5:13, 2 Chronicles 20:21, 2 Chronicles 29:30, Ezra 3:11, Exodus 15:1). 1 2 3 4 5 6 7 8 9 10 Old, Hughes Oliphant (2002). Worship. Louisville, KY: Westminster John Knox Press. p. 36. ISBN 978-0664225797. ↑ Charlesworth, James H., ed. and trans. The Odes of Solomon. Oxford: Oxford UP, 1973, 4. 1 2 Benedict, Philip (2002). Christ's Churches Purely Reformed. New Haven: Yale University Press. ISBN 978-0300105070. 1 2 White, James F. (1989). Protestant Worship. Louisville, KY: Westminster/John Knox Press. ISBN 978-0664250379. 1 2 3 4 Haykin, Michael A.G.; Robinson, C. Jeffrey (2011). "Particular Baptist Debates about Communion and Hymn-Singing". In Haykin, Michael A.G.; Jones, Jones. Drawn Into Controversie: Reformed Theological Diversity and Debates Within Seventeenth-Century British Puritanism. Göttingen, Germany: Vandenhoeck & Ruprecht.